I am currently in Atlantic City, New Jersey at the USSC Sign World conference for a few days. I have the honour of doing three presentations during the trade show. Attending this east coast conference is also a wonderful opportunity to spend a little time with many sign friends whom I don't get to see very often. Today I was absolutely delighted to spend a little time with a very special hero of mine... Bill Riedel from Hackensack, New Jersey. 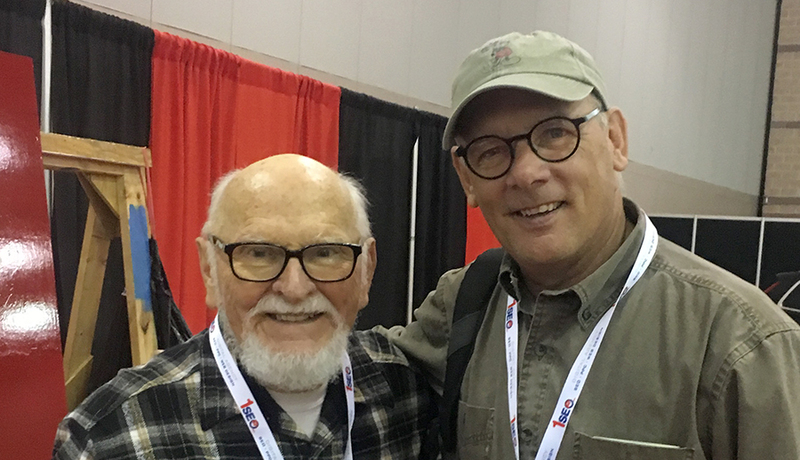 Bill is one of the biggest (and oldest) inspirations in the sign industry. He's been a fixture at every Wall Dog and Letterhead meet I've attended through the years and like me, everyone in the industry looks up to him in a big way. Bill is an incredibly talented artist and yet down to earth and humble. He is always willing and eager to share his knowledge with anyone interested in our craft. Although long past normal retirement age, it hasn't slowed him down in the least. Thanks for the inspiration Bill!